Take a closer look at its two publicly traded classes of stock. 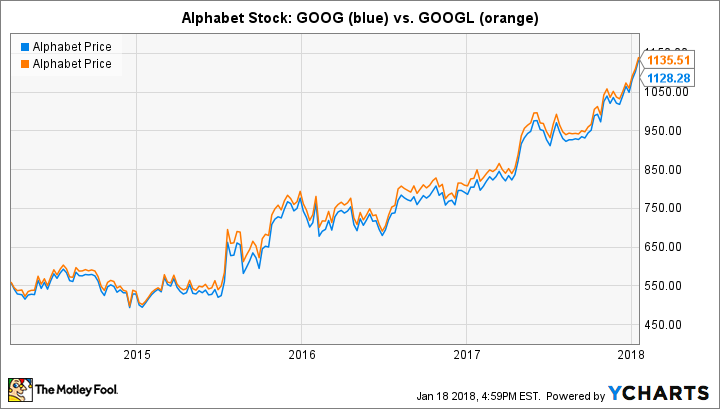 In the early 2010s, Alphabet (NASDAQ:GOOG) (NASDAQ:GOOGL) made a move that, at the time, was unusual. In doing a stock split, the company chose to create a new class of stock rather than simply issue new shares of its existing stock class. That new class had no voting rights, resulting in no change in comparable voting power between regular shareholders and the insider holders of special Alphabet shares with additional voting rights. At the time, investors put considerable value in the voting rights in the older class A shares, giving that stock class a premium over the non-voting class C shares. Yet over time, that premium has diminished, and now, it has almost entirely disappeared. That leads to an obvious question: What happened to make Alphabet investors no longer care about their voting rights? The answer could shed some light on whether it makes sense to buy Class A voting shares or Class C non-voting shares going forward. Alphabet's unusual split structure was deeply controversial at the time. Some investors noted that the move essentially gave the insider class of controlling shareholders an ability to sell off part of their economic interest in the company without having to give up voting control. Legal disputes ensued, and Alphabet eventually reached a settlement under which it agreed to compensate shareholders to the extent that the discount in the price of non-voting shares exceeded 1%. That settlement eventually resulted in Alphabet shareholders in 2015 getting a small increase in the number of Class C non-voting shares they owned, working out to a value of just over $1.50 per share. Back then, the differences in value between the voting and non-voting shares was often substantial. Price disparities of $20 to $30 per share weren't uncommon, and at the then-lower share price, it wasn't uncommon to see differences of 2% to as much as 6%. Even as recently as mid-2017, you could find 2% to 3% gaps in the value of the two share classes. Now, though, those disparities have largely disappeared. Based on current prices, the difference between the two shares was just $6, or just over 0.5%. Investors seem not to put much value on the voting rights that Class A shares give them. Has anything changed at Alphabet? To be fair, it isn't as though investors have lost interest in the voting shares. Class A and Class C shares both trade in roughly equal proportions on a daily basis, giving neither one any particular advantage in terms of investor liquidity. Both share classes are components of key indexes, including the Nasdaq 100. One reason for the convergence could simply be that voting shareholders have realized just how little say they have in the governance of the company. Alphabet insiders have shares that have 10 times the voting rights of Class A shares, giving them effective control of major decisions. Yet shareholders haven't given up. A shareholder proposal in 2017 suggested changing the voting rights of the two classes, reducing the preference that insiders have. The measure went down to defeat, but if you assume that insiders voted against the measure, the vote counts suggest that ordinary Class A voters favored the measure by a greater than 3-to-2 margin. Again, though, as long as insiders retain control, such proposals will be fruitless, except to express the discontent of ordinary shareholders. That despair is the likely reason why voting shares aren't seeing much of a premium anymore. With voting shares having almost no premium over non-voting shares, investors should consider choosing Class A over Class C simply in the hopes that a premium might return in the future. That's far from a certainty, but for those who believe in shareholder rights, it's at least possible that Alphabet will change its ways and give its voting shares more of a say in the governance of the tech giant in the future.